La Capanna, 2-room semi-detached house 35 m2, on the ground floor. Comfortable and tasteful furnishings: living/dining room with open-hearth fireplace and satellite TV. 1 double bedroom with air conditioning. Kitchenette (4 hot plates, oven). Shower/bidet/WC. Terrace furniture. Maximum 1 pet/ dog allowed. The Leonardo da Vinci holiday farm is built on a hill a few km from the centre of the village of the same name. There are 3 apartments and a small independent house. The owners live in a separate building. 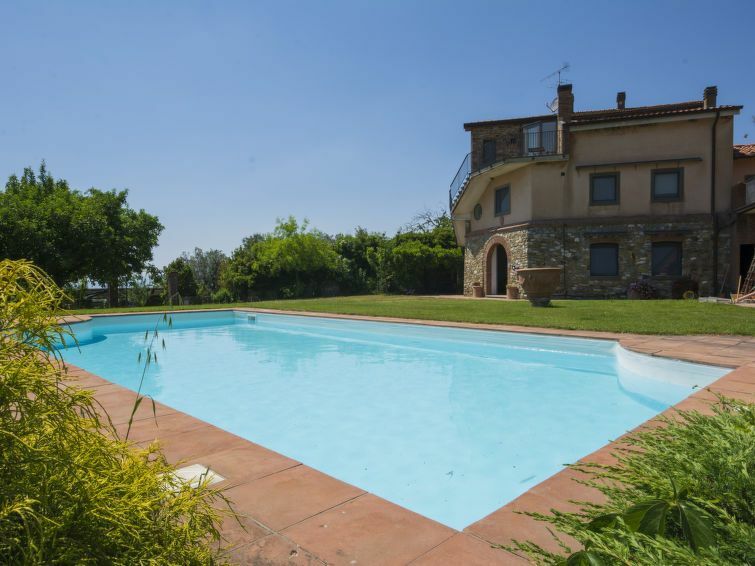 The panoramic terrace overlooking the swimming pool is the ideal spot for an open-air meal in the countryside large working farm Leonardo, 300 m a.s.l.. 4 apartments in the property. 4 km from the centre of Vinci, 35 km from the centre of Firenze, 45 km from the centre of San Gimignano, on top of a hill, in the countryside. For shared use: property 6 ha, swimming pool (11 x 5 m, depth 150 cm, 15.05.-12.09.). Barbecue. In the house: WiFi, washing machine, tumble dryer (for shared use, extra), heating to be paid on the spot (01.11.-15.04. ), heating available only from 01.11. to 15.04.. Parking at the house. Shop 4 km, restaurant 300 m, railway station Empoli 14 km, thermal baths Montecatini Terme 22 km. Golf course (18 hole) 16 km. Nearby attractions: Carmignano 19 km, San Miniato 20 km, Pistoia 22 km, San Casciano in Val di Pesa 40 km. WiFi works only on the terrace.